from the realm of the dead (NIV). Today’s reading from Psalm 86 begins with this prophetic declaration. All the nations you have made will come and worship before you, Lord; they will bring glory to your name. Psalm 86 is a prayer of David, but within this prayer David makes this prophetic statement about all nations worshipping the Lord. By the Spirit of God, David saw and declared what is to come. In the pantheistic world of his time, David saw that the God he served was not a local or national god. He saw that Yahweh, the LORD was, is and will be the Lord over all. How could David know that the God of Israel would come to be worshipped in every nation on the earth? David grasped the big picture. Or a better explanation might be that the God of the big picture grasped David and revealed this truth to him. Through David’s line would come a Savior—a Savior named Jesus—a Jewish Savior for the whole world. Why was David able to receive such a profound revelation? We are given a clue in the words of his prayer. Teach me your way, LORD, that I may rely on your faithfulness; give me an undivided heart, that I may fear your name. The answer may lie in David’s heart. He had an undivided heart. In other words he was wholehearted in his love for the Lord. He had a single-minded focus on God. He says just that in the next line of his prayer. I will praise you, Lord my God, with all my heart; I will glorify your name forever. Are you wholehearted in your love and praise for the Lord? Response: LORD God, unite my heart to praise your name. I don’t want to be distracted by the pursuits of this world. I set my affection on you. Thank you for loving me as your child. Amen. Your Turn: What are some of the things that distract you from loving and fearing God? that we may be saved (NIV). Have you been greeted by a happy face today? I’m talking about the ubiquitous, yellow, happy face stickers that pop up everywhere, especially in any form of online communication. ! We all recognize that these happy faces are intended to brighten our day—make us feel happy like the smiley face shows. I’m not sure they always succeed in their objective. Of course a bright, shining human face with a broad genuine smile is much better in communicating happiness than a symbolic sticker on a screen. Real live face time trumps online communication in every way—at least it should. Some things—most things—are communicated best face to face. Here in Psalm 80, the psalmist, Asaph, pleads for face time with the LORD. In fact, in the entire psalm, Asaph repeats this request three times. Restore us, O God; make your face shine on us, that we may be saved. 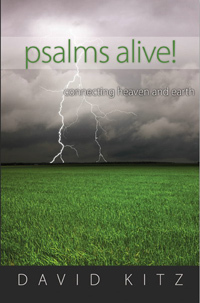 Clearly, the psalmist is longing to see the smiley face of God—the shining face of God. Response: Father God, today I need face time with you. Show me your kindness. Help me to sense you smiling down on me like a loving parent smiles down on their child. Thanks for your grace. Amen. Your Turn: Have you recently sensed God smiling down on you? How did that make you feel? My eyes fail, looking for my God. my guilt is not hidden from you (NIV). Above all else Psalm 69 is a plea for help. Save me, O God, for the waters have come up to my neck. Have you ever been neck deep in trouble? I’ve been there and it’s not an entirely pleasant experience. I recall hanging upside down in my car, which was sitting on its roof in a snow-covered ditch. My wife was suspended upside down in the driver’s seat beside me. Suddenly finding yourself upside down after a high-speed-icy skid can be unsettling. I recall unfastening my seatbelt so I could reverse my position and sit upright on the interior of the car roof. Opening the car doors was impossible due to the snow jammed up on the outside. There we sat, trapped, car tires in the air, as the sun began to set. We had two life lines: a mobile phone and a direct line to Jesus. Both worked flawlessly. Within minutes a young couple stopped and helped us out of the car. Later that evening we drove our flipped car back into the city undamaged. There was nothing to indicate we were in a rollover, not even a scratch on the car body. This true account serves as a reminder to me that God hears us when we pray. When we are in over our head—when we are neck deep and beyond—we can call out to God. God did not save us because we are faultless. As the psalmist says, “You, God, know my folly; my guilt is not hidden from you.” God saves us because of His great mercy. Response: LORD God, thank you for showing us mercy when we don’t deserve it. Thank you for coming to rescue the likes of me. For this mercy and a thousand more, I give you thanks. Amen. Your Turn: Has the Lord helped you when you were neck deep in trouble? I have a tendency to be forgetful. As I leave the house, it is not uncommon for me to forget some rather important items such as my wallet or my mobile phone. On a recent trip to Japan, my wife would often help me run through a checklist of essential items as we set out on an excursion. Wallet, rail pass, mobile phone and passport, all were needed. I dare not forget any of these.